Welcome to the Boston Organ Studio’s 2018 Northern Europe Study Trip blog! We are excited to share this experience with you, our readers, through daily posts. Please write to us in the comments section below — and share these posts on social media! 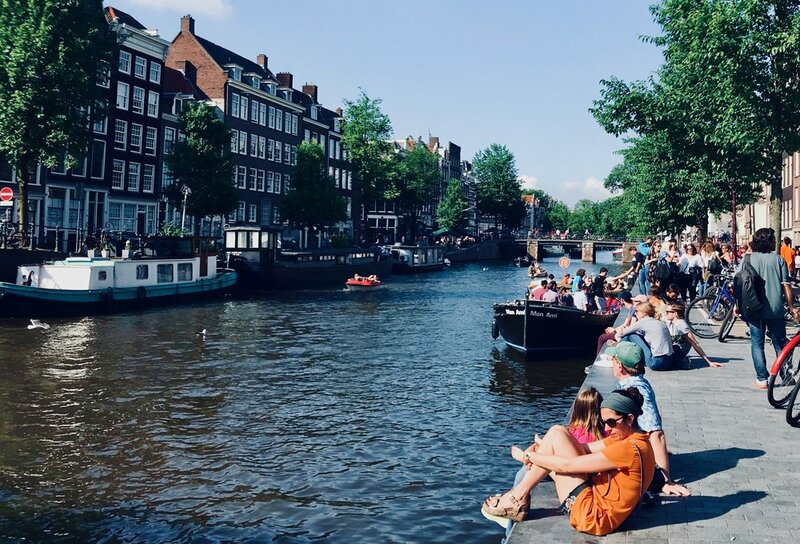 Our official start of the study tour and rendezvous in Amsterdam was planned for Monday. However, Jennifer was disappointed that she had missed playing at St.-Bavokerk, the Grote Kerk (great church) of Haarlem, on previous trips. With her encouragement, our leader was able to snag us an appointment there after the Sunday morning services. The four of us already in the country – Jennifer, Chelsea, Corey, and myself – were excited to take advantage of this special opportunity! Unfortunately, for those of us just arrived from the States, it meant no sleeping in! And I made it even more painful for myself given my goal of attending the 10:00 service before our appointment, as I wanted to hear the organ used as part of an actual church service. Having just arrived from Boston on Saturday, and planning to spend the weekend sightseeing in Utrecht, I dragged myself out of bed at the equivalent of 2 a.m. EDT, dashed down to Utrecht Centraal, and managed to locate the correct trains from Utrecht to Haarlem, arriving just in time for the second half of the prelude. The service was in Dutch, so I didn't understand much, but there was extensive use of music, with four hymns, a psalm, and Kyrie from the songbook, and organ prelude, interludes, offering, and postlude music. It was exciting to hear Scheidemann (prelude) and Böhm (postlude) played in something like their native habitat. The singing was considerably more robust than at the French Catholic churches I attended last year in Paris, and the Dutch reformed hymns (some classic, some modern) have a sturdy and compelling character. There were perhaps 60 to 80 congregants, including many older people but also a number of families with young children. The children amused themselves afterwards by playing tag around the cavernous church while the adults chatted at coffee hour. Shortly before noon my three companions found their way into the church and we introduced ourselves to the organist, Anton Pauw, who proceeded us to give us a very brief tour of the organ before dashing to another appointment. Wikipedia notes that this organ, built by Christiaan Müller between 1735 and 1738, is one of the world's most historically important organs. Upon completion it was the largest organ in the world; it was played by Mendelssohn, Händel, and the 10-year-old Mozart, among other famous musicians. While the façade is particularly impressive to visitors, we were also impressed by the large draw-knobs and (mostly) logical layout of the stops, as well as the beautiful tones of the organ, which seemed to float around the cathedral. The touch was somewhat heavy, even without the couplers, but the acoustic was extremely forgiving. Without having Chris there, we were forced to fumble with our own registrations – an excellent exercise! – although Corey provided invaluable assistance. While our playing was far from concert-quality, the visitors wandering around far below us seemed pleased to have a demonstration of the organ in progress. After a practice run I was pleased to make a rather good rendition of my mother’s chorale on Nun ruhen alle Walder(Now All the Woods are Sleeping) to add a few contemporary sounds to the Bach and Buxtehude that were played in abundance. Corey De Tar assists Jennifer Hsiao with registrations in St-Bavo. Boston Organ Studio. After a cloudy and cool day yesterday, the sun came out today and the air warmed up considerably. 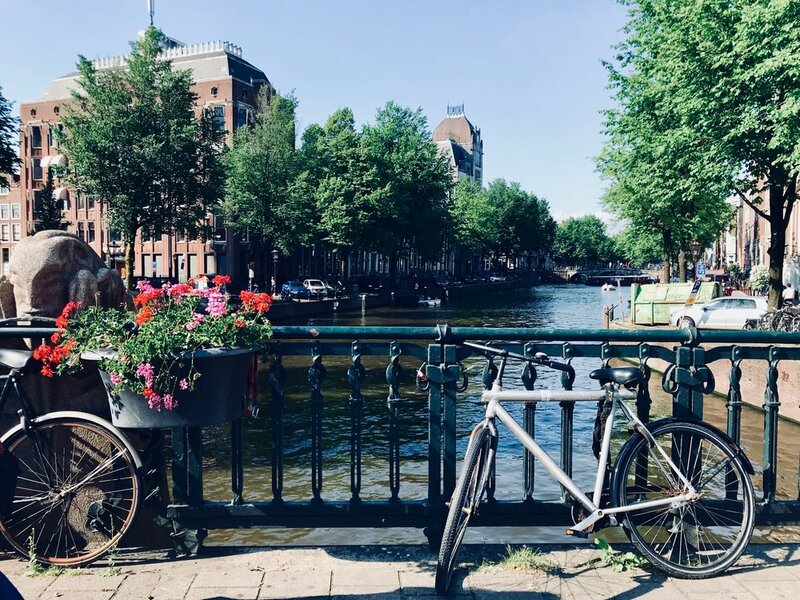 We had lunch at a sidewalk café near the train station and then went our separate ways to Amsterdam and Utrecht, looking forward to tomorrow’s meeting with the larger group in Amsterdam! The facade of the Christian Muller organ at St.-Bavokerk, Haarlem. Boston Organ Studio. 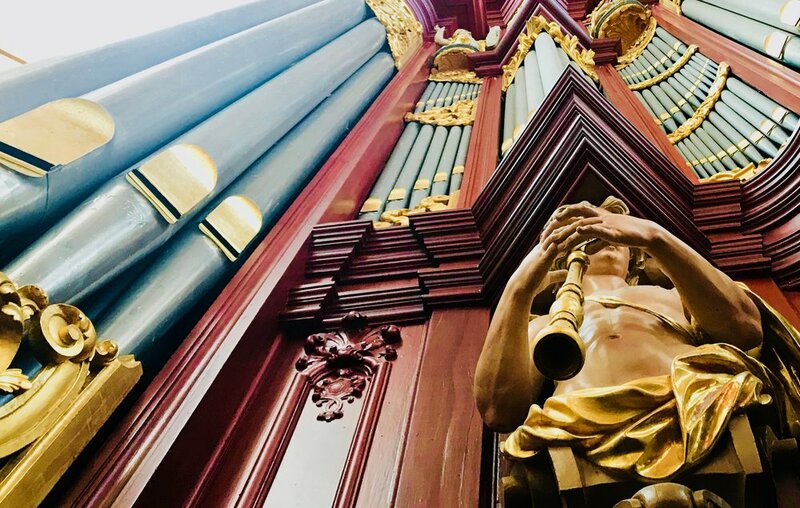 Anton Pauw demonstrates the Muller organ in St-Bavo, Haarlem. Muller pipe organ, St-Bavo, Haarlem. Keydesk and stop knobs, Muller organ, St-Bavo, Haarlem. Chelsea Keating plays the Muller organ in St-Bavo, Haarlem. Boston Organ Studio. Corey De Tar plays the Muller organ in St-Bavo, Haarlem. Boston Organ Studio. Stop knob detail, Muller organ, St-Bavo, Haarlem. Jennifer Hsiao plays the Muller organ in St-Bavo, Haarlem. Corey De Tar assists Jennifer Hsiao at the Muller organ in St-Bavo, Haarlem. Chris Porter performs a work composed by his mother, Emily Maxson Porter, at St-Bavo, Haarlem. 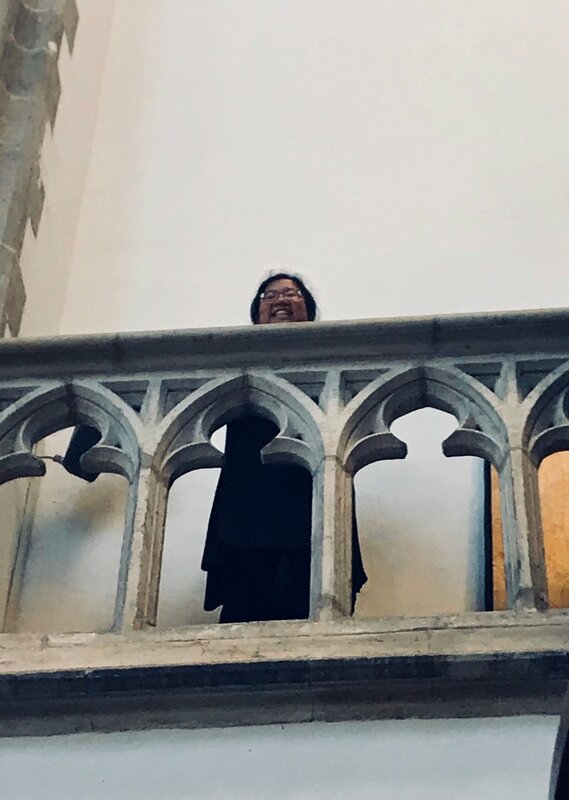 Jennifer Hsiao peers down from the triforium in St-Bavo, Haarlem. Corey De Tar at the console of St-Bavo, Haarlem. Boston Organ Studio. Boston Organ Studio member Adrian Cho, enroute to Amsterdam via a visit to the CERN Particle Accelerator in Switzerland. A view of a control room at CERN. Boston Organ Studio member visits the romantic organ in Kevalaer, enroute to meeting the group in Amsterdam. Boston Organ Studio member Jennifer Hsiao, enroute to meet the group in Amsterdam, is all smiles as she explores the German countryside from above!